On rushed days, where I never really thought about dinner all day, I make this recipe. I almost always have frozen chicken breasts and all of the rest of the ingredients in the house, so it just makes sense! I kind of have a Mexican Food obsession though. You can see that from my list of Slow Cooker Mexican Meals! This recipe is very versatile. Sometimes I eat it like fajitas. When I do that, I usually sauté some peppers and onions in the skillet, then, when the chicken is done cooking in the Instant Pot, I will slice it up (or shred it) and add it to the skillet, to crisp it up and cook off some of the liquid a bit. Of course, there’s times that I don’t have all of those ingredients on hand, so I’ll just eat it like this. Over lettuce, as a low-carb taco salad. Personally, I prefer it on nachos or if I’m trying to watch my carb intake, just over lettuce. However you eat it, it’s so very delicious! 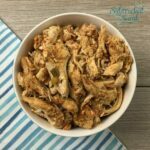 Instant Pot Shredded Mexican Chicken recipe is a very versatile recipe. You can eat it over chips, over lettuce or in taco shells. Cook on Manual, High Pressure for 35 minutes (if chicken breasts were frozen) or 20 minutes, if they weren't. Remove chicken and slice or shred. This recipe can also be made in the slow cooker. Cook on low for 5-6 hours.